One of the many joys of walking through San Francisco is all the different nooks and alleys that you find and the odd things that inhabit them. In my own neighborhood (The Mission) there is a large community garden that is in a one way street which you would never see if you didn't enjoy walking up the smaller streets in the city. This garden happens to be 1/2 block from my house and I walk or bicycle by it as often as I can. It's about 1/4 of a block in size and the plots are broken up into what looks like 4 foot by 8 foot sections. Each plot is tended by someone and there are a variety of different types of plants there. Some people grow vegetables (including tomatoes and corn) some grow inedible plants that are just fun to look at or smell. The place always has a natural feel to it that is quite pleasant to run across in the big city. 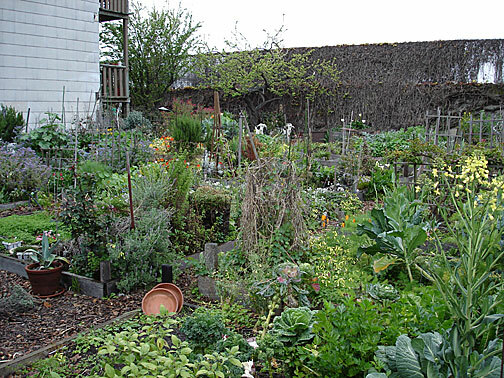 The garden is part of SLUG (San Francisco League of Urban Gardeners) but I had never really known the history of it until recently. One Saturday morning I was walking back from my breakfast and noticed that there was someone working on their plot and decided to ask a few questions about the garden. What I learned was that this is the only garden that SLUG actually owns, most of the other SLUG gardens are part of SF Rec and Park's property. This curious turn of events came about due to the closing of the Pepsi Bottling plant that used to be in the Mission. The particular plot of land that the garden now rests on used to be a parking lot for the bottling plant. This seems weird to me, I'd hate to think of what traffic was like on tiny Dearborn Street with people driving in and out to park in that lot for shifts at the plant. 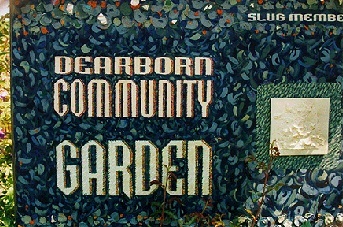 When the bottling plant closed in the 1970s, neighbors were able to get the land from Pepsi on loan and put in the garden. Then in 1992 when Pepsi Co. finally gave up the land, and the Police Station was moved to its present 17th and Valencia location the land was actually deeded over to SLUG. It does seem that they saved paradise and tore up a parking lot. This garden is now so popular that the waiting list is closed. Most other SLUG gardens have a couple of year waiting list as it is, but this place, being so central (it's between 17th and 18th, and Valencia and Guerrero) had a 7-year list at one point so they just closed it. It's a great garden, it's a shame that there aren't more like it.